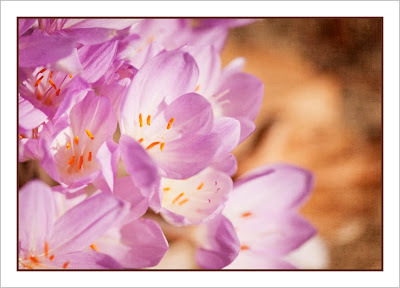 I just know them as autumn crocus. I LOVE their color. They come up as just leaves in the spring. Then, in the fall, the bloom emerge on single stems. I read about them years ago and planted some. They have multiplied enough that they need to be divided now. Love your blog and never miss it! We have autumn crocuses. I love them because they have the same optimism as spring crocuses and remind us that even though the days are getting shorter and colder, there is cause to celebrate. Delicate and beautiful! Thanks for sharing it with us! Kate and Lori nailed it. We're seeing them too. And yesterday on our walk through the n'borhood we saw 6 quail! Have a great weekend. What the heck are those little flowers? I wonder if someone forced them in their fridge and then planted them? What a nice surprise. Colchicum autumnale is the most likely plant you are seeing. There are numerous species within the genus. Nobody mentioned that autumn crocus is a poisonous flower. At least, the European ones are! !